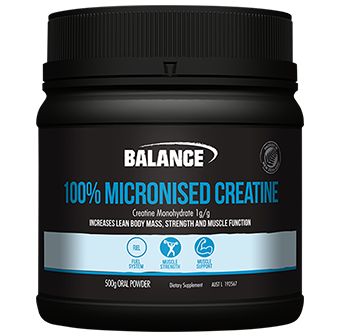 Balance 100% Micronised Creatine - Supplementing with Balance 100% Micronised Creatine can help you maximise energy production and improve overall performance. This product is Pharmaceutical Grade Micronised Creatine Monohydrate, HPLC-tested to ensure purity. Studies show Creatine supplementation increases total muscle Creatine stores. Creatine Monohydrate is a key to improved muscle strength and power. Creatine promotes the formation of ATP (Adenosine Triphosphate), the body's essential source of cellular energy. ATP is vital for instant and sustained energy. A depletion of muscular Creatine can lead to reduced muscle power and rapid onset of fatigue. Definitely notice an energy boost when I use this. Recommend it. Pharmaceutical Grade Micronised Creatine Monohydrate (100%). Contains no added Yeast, Gluten, Lactose, Dairy Products, Flavours, Sweeteners, Colour, Soy, Animal Products, Egg, Fish, Preservatives and Salt. How: Loading Phase: Take one serve 4 times daily for 5 days. When: Creatine is best taken before workouts to aid performance and post workouts to assist recovery. 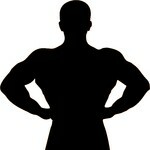 Who: Tri- and team sports competitions, bodybuilders and weight- training individuals, elite athletes. Keep in a cool dark place and out of direct sunlight,store below 30°C. Keep out of reach of children.